Happy Monday! I hope your weekend was as fabulous as ours was…we spent it celebrating a completed project! I’ve spent a ridiculous amount of time this past weekend walking around in circles in my house, just because I can! 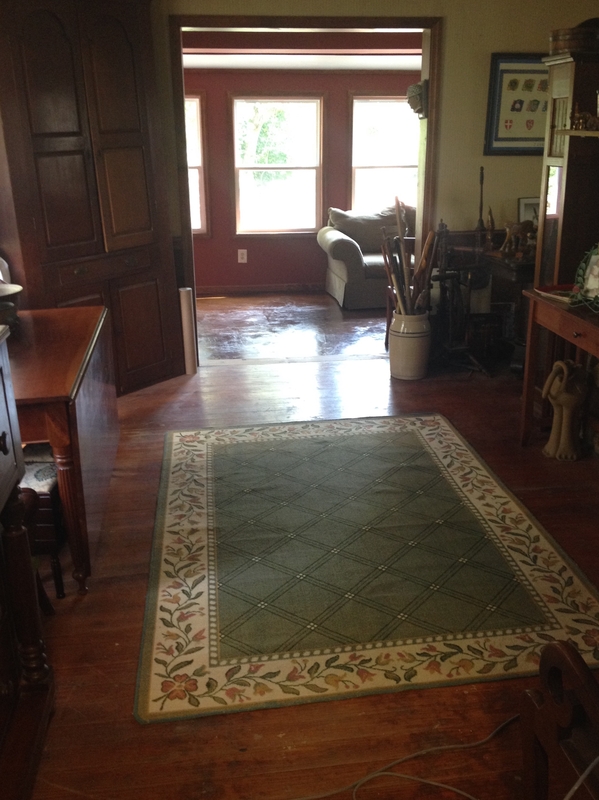 Yep, we finally got to move everything back to the sunroom, which means I can walk through the dining room again! Remember this? We’ve moved it all…again! Ok…let me not tell a lie…Coach and our nephew (A.R.) moved everything back, while I and A.R.’s two friends stood, watched, and provided commentary. 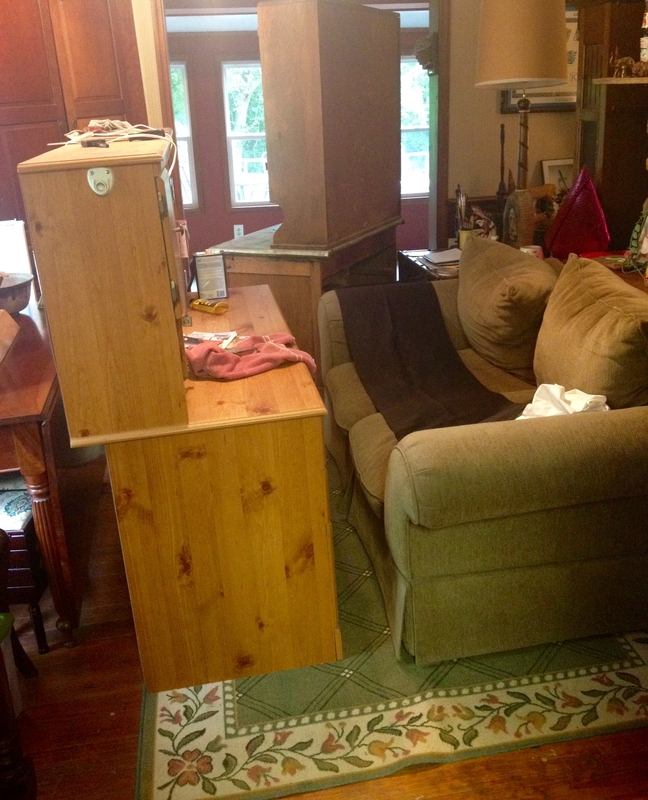 I, of course, had to point where to put the furniture, but the friends just had to reassure A.R. that he was not going to up-chuck the burger he had jut eaten. Moving heavy pieces of furniture on a full stomach may not have been his smartest move to date! 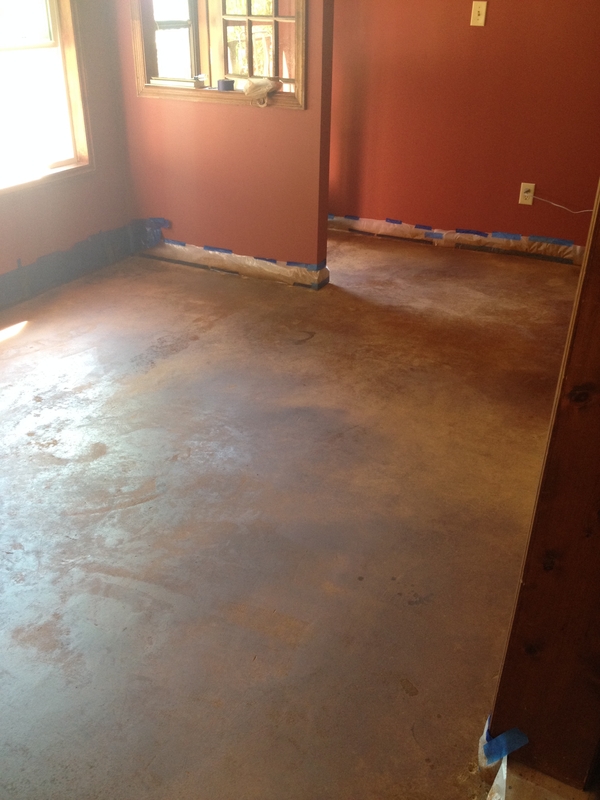 Of course, that means the floor staining is complete in the sunroom! 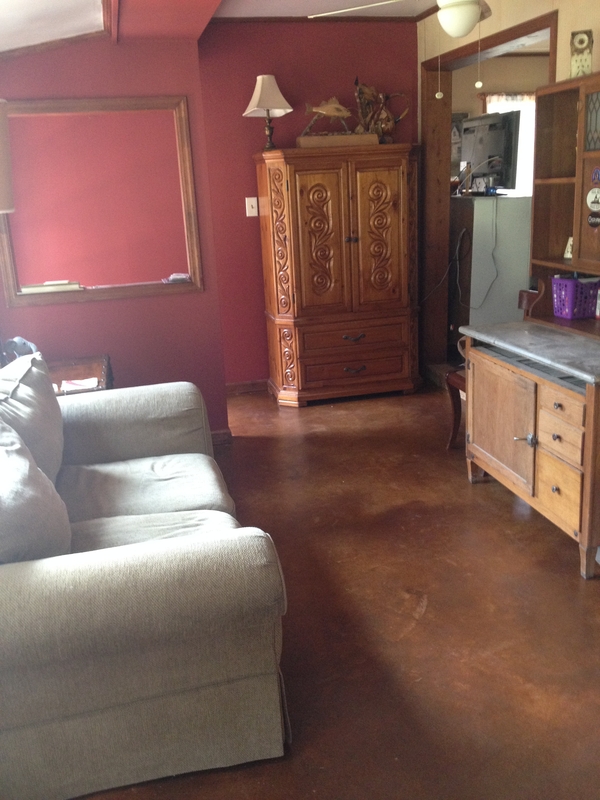 It’s all done, and I still love my guy, but I don’t have much to say about the floor stain. I’ll just show you. The stain is a very pretty color. 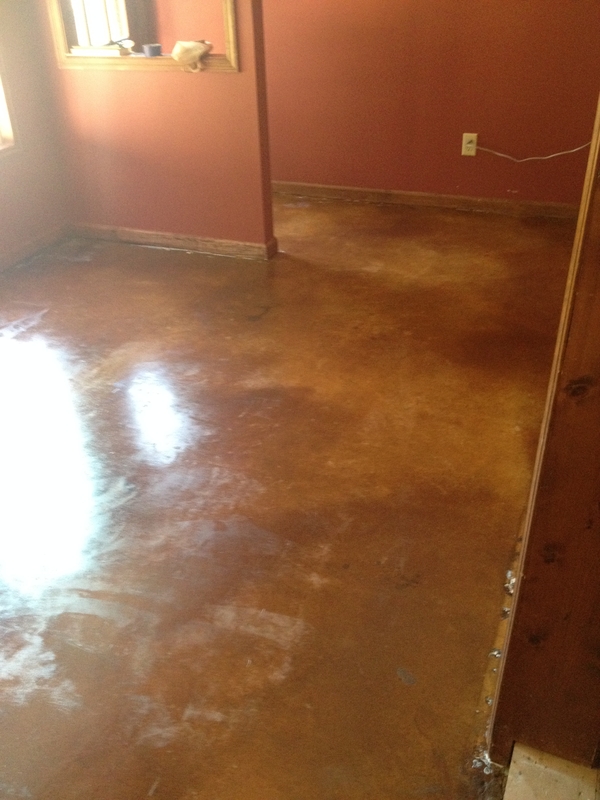 The concrete was a very wide array of darks and lights, so the stain is, too. That doesn’t bother me, because it just gives it character, which I love. The end result just wasn’t what I had imagined, but we’ll leave it at that. I think the part that made me sit down and cry tears of relief on Saturday night was the fact that I was able to clean my house. I’m the type of person who can’t walk by a mess without stopping to address is, and I can’t see dust without it worrying me to pieces. Since the house was too crowded up to pass through without injury, I just had to let it go. I couldn’t get to the dirtiest things, and the filthy things I could get to were covered over with extra junk. It was a harrowing three weeks, let me tell ya. The minute the last piece of furniture was in place, out came the vacuum and the dust rag and the Swiffer sweeper and the elbow grease! When I finished my cleaning frenzy, I called Madre and told her I needed someone to come in and see it. She came right down and “oooh’d and ahhh’d” my work, which is what prompted the happy tears. Then, Coach and the girls and I hopped in TheMiniVanWithAPlan and went out to a celebratory dinner (We weren’t in any shape to go somewhere nice, and we still looked nicer than some, even with my sweaty, dust-filled hair, because we were all fully dressed), and to buy some area rugs for the sunroom. We found this one (after going to four other places) at…get ready for it….the store I love to hate….Walmart! It’s Mohawk brand, which I realize means the Walmart version of Mohawk, but still made me feel like we got a great deal at only $89 for a 5′ x 7′. 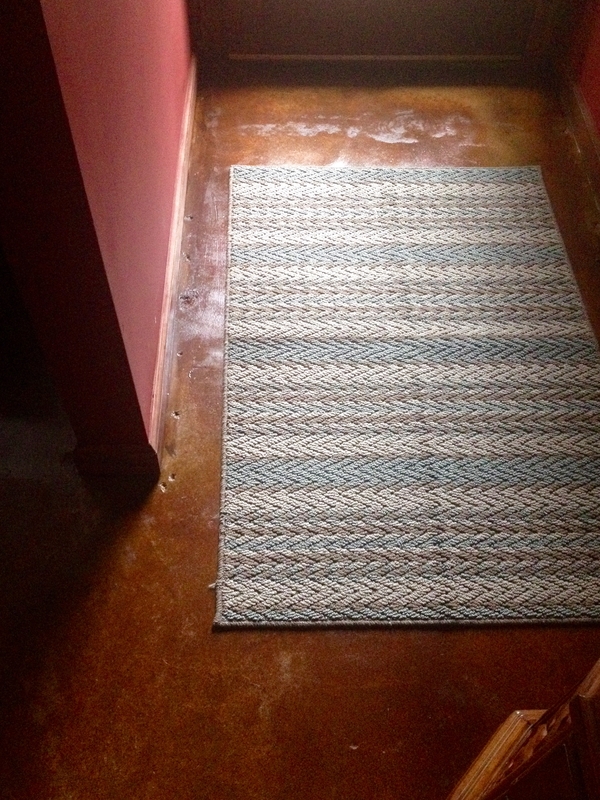 They had smaller rugs to accent all the pretty larger ones, so we picked this one up for in front of the door. 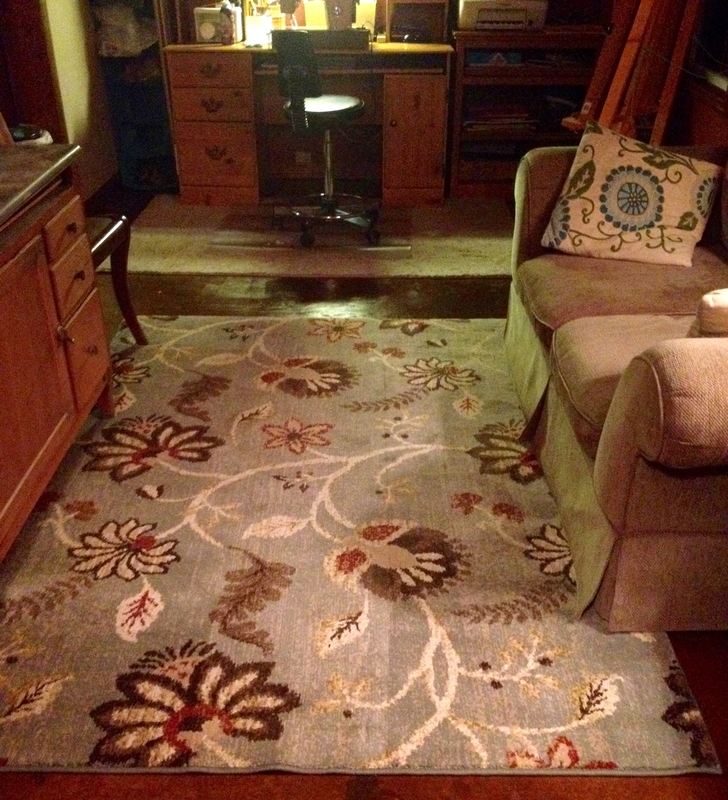 The rug in front of my sewing table is cheap-o Dollar General, but I needed a rug to put under my chair mat…I have to be able to roll around! What fun is a chair on wheels if you can’t roll around (without scratching up my new floor stain)? The room is a cozy, snuggly, den by night, and sunny and bright in the daytime, which is exactly what I wanted it to feel like! It’s a little dark in there with the stained trim, brick-red paint, and stained floor, so I wanted a rug that was fairly light (without being white), and that had just a touch of red. I’m thrilled to have found what I was looking for, and even more thrilled to have it be blue…my favorite color! It looks nice with my throw pillows, don’t ya think? Can you guess what I’m most excited about? 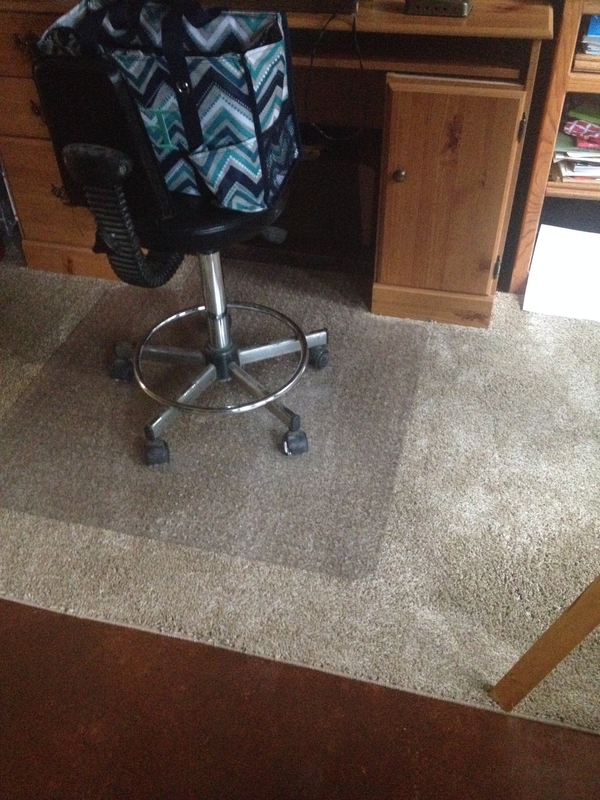 That’s right…I have my office back! 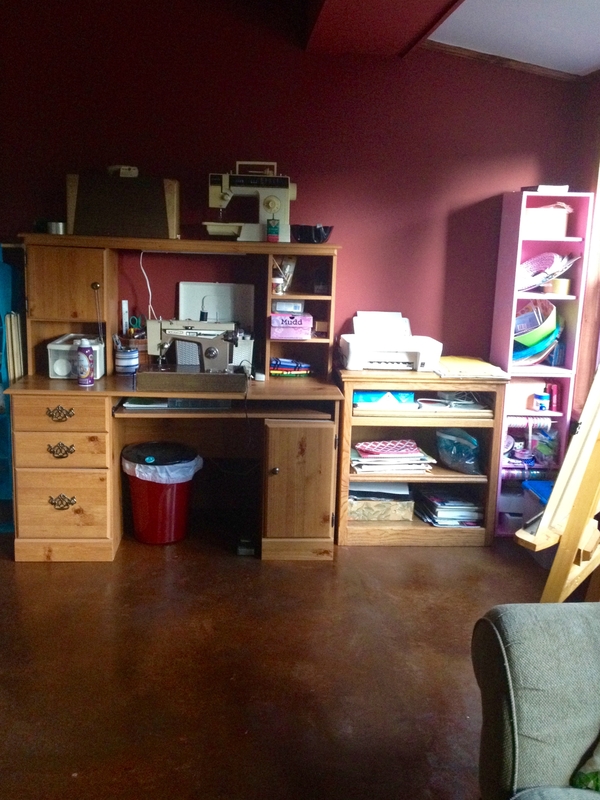 My craft space, before rugs. Sewing in the dark, cramped hallway was not fun! (It has been especially unpleasant in the hall over the past few days, because something has found it’s way under the house and expired, leaving our hallway smelling like a three-week-old murder scene that just got discovered. I guess it’ll take the rodents in the neighborhood a while to spread the word that they can’t get into our house anymore, thanks to Coach’s mouse-hole plugging and covering project last week. It doesn’t mean they can’t get under, though, where we’ve left lots of “snacks” for them…the kind of snacks that cause a rodent to expire.) I’m looking forward to working in the new room today; I just hope I actually get some product made instead of organizing my space all day! 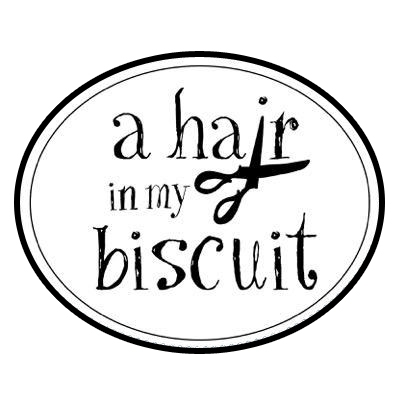 I have two big craft fairs coming up, and I really must build up my stock! We get to enjoy the newly-re-put-together house for a whole week before everything that is upstairs has to come downstairs. It will be ham-scam for a much shorter period of time, and when it’s over, the girls will have brand-new carpet in their room and on the stairs! You’ll just have to wait to get the “before” pictures of upstairs…but I promise to share the whole transformation with you soon! What a great weekend, celebrating a completed project! If we can survive the past three weeks, I think we can survive anything. 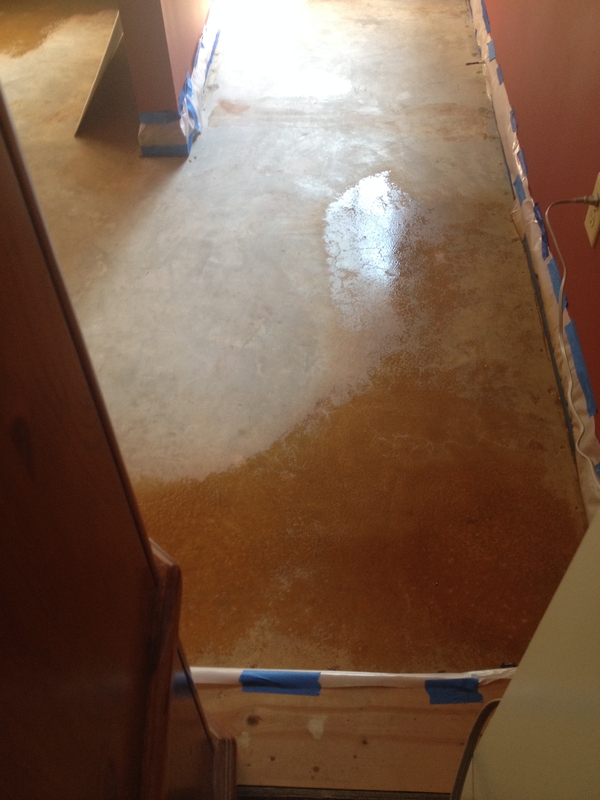 The rest of the major overhauls will have to wait a while, because we have no desire to rip up floors in the cold-weather months. At this moment in time, I love my home all over again, and I want to enjoy it for a good, long while! Bummer! I’m sorry that happened, but definitely good it happened when it did! Coach loves duct tape and Gorilla tape…I’ve had to talk him down from repairing things with them on occasion! Happy travels!! ? Thank you! I’m loving it! ? Martie! Congratulations on the completion of your home renovation! I’m sure you cried tears of joy and relief! How lovely…Thank you for sharing your journey with us! I’ve never been a part of home renovation before (living for the most part in rented apartments) but I can imagine the relief and satisfaction when it’s all done! Enjoy! Many years of happiness in your new space! That we will! Thank you! I almost miss apartments…with that I could always just call maintenance! Lol!